Taiyaki is a common street food and snack that survived in Tokyo. It is astounding to see how many shops there still are all over Tokyo, making it for sure one of the most popular traditional snacks in the capital. Taiyaki is a Japanese cake in the form of a sea bream filled with sweetened azuki beans. By the way, you do not need to worry about the fish-shape having any relationship to some sort of fish flavour, this snack has no fish taste at all. It originates from the Meiji period (1868-1912) in Tokyo. 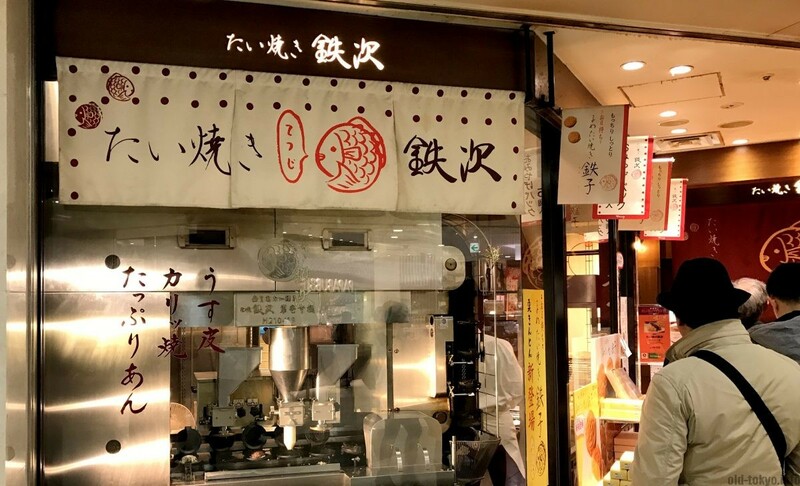 While the exact store where taiyaki originated is not know, there is speculation that it was at Naniwaya Souhoten in Azabu-juban (see naniwaya in the list below). By the end of the Meiji period, the term taiyaki started to appear here and there in magazines and novels. 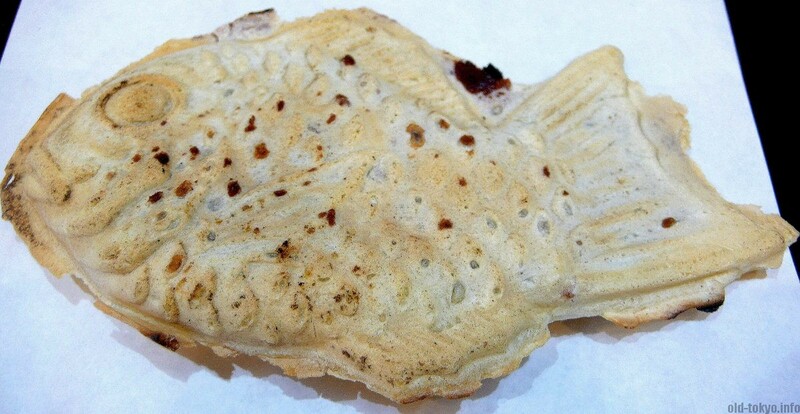 However, there is a rival theory that puts the origin of taiyaki in Mie prefecture. Taiyaki is thought to be a variation on imagawayaki (今川焼き) that was popular in Tokyo at the end of the 18th century. It was a snack sold near the Imagawabashi bridge in Kanda, hence the name. 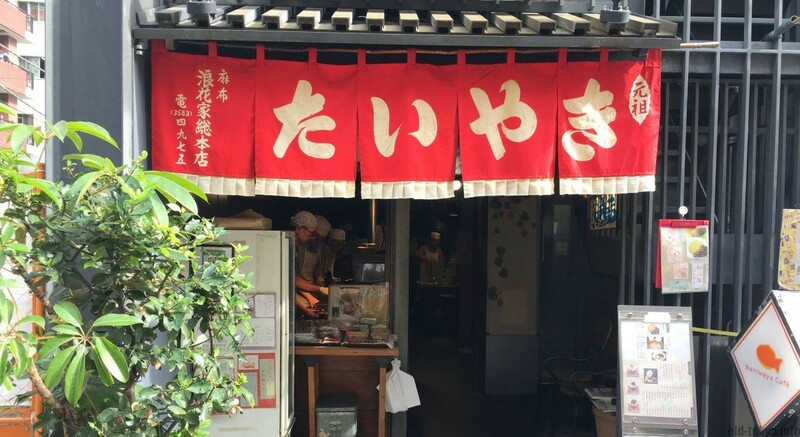 This puts the roots of taiyaki firmly in Tokyo. The shape of the sea bream fish (tai in Japanese) is there for a reason. This fish is traditionally eaten on happy occasions, but it is at the same time also an expensive fish. So expensive that most people in the Meiji period could not afford it. By making a cheap snack in the form of this fish, everyone could enjoy it. Taiyaki is a cheap and very tasty snack indeed, made freshly and warm, to sweeten up your day for JPY 100-200 for one. These days there are many varieties on the market, with ice cream, with green tea flavour, even cheese and sausage. The traditional taiyaku has an azuki sweet beans filling, but custard cream is another filling that is very common these days, making it some sort of cream puff. The shell is usually made from regular pancake or waffle batter. Taiyaki shaped in the form of other fish, or even cats are all the rage these days. Go to Tsukiji Sanokiya for tuna-shaped taiyaki, or Manekiya in Yanaka for a cat-shaped taiyaki. I would highly recommend to visit one of the traditional shops in Tokyo and order the plain general taiyaki. It pays of to going to one of the shops listed below as the quality of the taiyaki that you will get can vary significantly. It might be sometimes difficult to order as most of these stores have only a Japanese menu, but if you just ask for one taiyaki there should be no problem. My favourites in the list below are Nezu no Taiyaki and Taiyaki Tetsuji. Only one type, the traditional taiyaki with azuki beans filling, is what you get here (makes ordering easy). 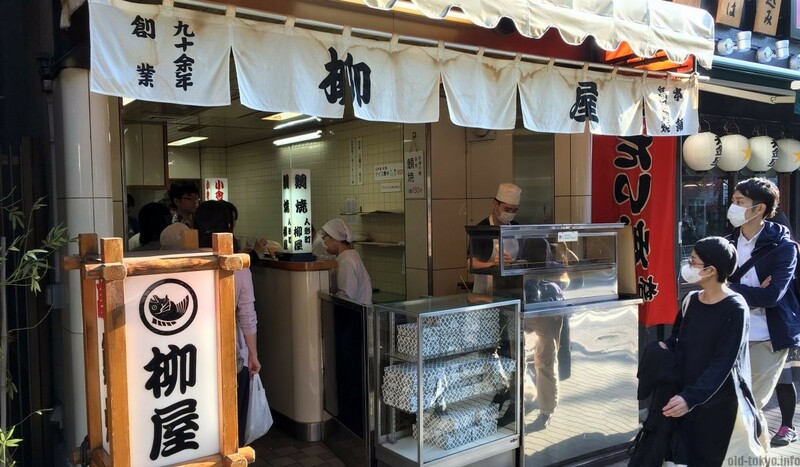 It is not the oldest taiyaki shop around, and unfortunately the building in which it is located is not all that impressive, but it means that people come here for the taste, not all the fancy stuff that comes with the environment. This store was started in the late 1950s and it is now managed by the second generation Nobuo Hayashi. Each taiyaki is prepared here individually by hand with a single taiyaki mold. Be sure to go early, as the store is very popular, there is always a line (waiting time usually about 10 to 20 minutes). The store opens at 10:30 and closes when they run out of batter and azuki beans, which is usually between 12:30 and 14:00. Please note that there are no seats in this store and that you will need to eat the taiyaki outside. Anything special when ordering? they only have one item, so just say how many you want. If you want to take them home, they sell boxes starting from 4 pieces. The cheapest box will cost you an additional JPY 60. Tucked away in a side-street close to Yotsuya station, this little store is located in the Wakaba area, which I quite like as you can find here the shitamachi feeling, even though it is a bit further away of the areas we now usually associate with shitamachi. The many temples in the area make a visit worthwhile, with a break at this place to eat some taiyaki. The store was started in 1896 and serves besides taiyaki also dango and kakigori (shaved ice) in summer. They also make the taiyaki here with a single mold in the traditional way. Inside the store there are a couple of benches (16 seats) where you can sit to eat your sweet delight and you can take some free green tea to go with it. Opening hours: Mon-Sat 9:00-19:00. Closed on Sunday. Anything special when ordering? Do not forget to get some free complimentary tea. Do not go on a Saturday, the waiting line is too long. Another place with a good reputation where you can eat the traditionally made taiyaki is Yanagiya in Ningyocho. This shop was established in 1916 and also here they use the single mold to create a crisp and tasty taiyaki. Funny thing is that they sell their taiyaki as high-grade (kokyu in Japanese), which goes a bit against the spirit of having this snack for the common man. Still, the price is right and the taste is great. They also have ice monaka if you need to cool down. The shop front of Yanagiya, on the famous Amazake street in Ningyocho. Opening hours: Mon-Sat 11:00-18:00. Closed on Sundays. Anything special when ordering? Be prepared to wait outside as the shop is rather small. This is the place where taiyaki might have originated according to some sources. Started in 1909, currently the fourth-generation owners are running the store. The store is on the first floor of an appartment building, as is Nezu no Taiyaki, but they have tried to recreate the old atmosphere with a beautiful wooden signboard and noren (traditional Japanese fabric dividers, hung between rooms, on walls, in doorways, or in windows). This store has many types of sweets (such as roll cake, shaved ice) and offers seats where you can eat it (sitting down will cost you more). As a take-out customer you have low priority so you might need to wait up to one hour on weekends. Please note that this store is not located in shitamachi, but a more posh area of Tokyo, popular with rich Japanese and foreigners. When I visited on a Friday I had to wait for 30 minutes. Opening hours: Mon, Wed-Sun 11:00-19:00. Closed on Tuesday and every third Wednesday of the month. Anything special when ordering? Have patience. This is actually a small chain with 3 stores: in Asagaya, Haneda airport (Terminal 1) and Tokyo Station. While the stores above might be more authentic, the taste and the crispyness of the taiyaki here will make you come back for more. As a first introduction I think you cannot go wrong with this one. The shape of this store’s taiyaki is a bit different from the traditional taiyaki with their round-shaped fish mold that is sort of pressed with a big machine (impressive to see while you wait). Need to fill your stomach with a small snack before you get on the shinkansen/plane or a light snack on the way? Then stop at Tetsuji Taiyaki, their round-shaped taiyaki have an excellent flavour. The shop front of Tetsuji in Daimaru department store. Tokyo Station (too many lines to mention). The closest entrance/exit is Yaesu North Exit. Anything special when ordering? Watch the machinery at work!